Wingworks offers serious bird hunters a heavy duty upgrade of the versatile strap-style upland wingshooting vest. 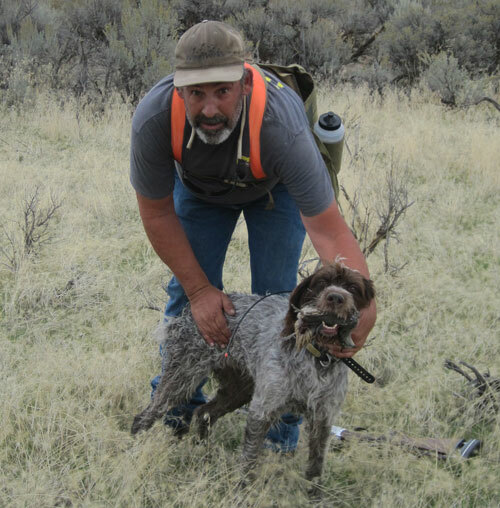 Originally developed by chukar hunters in the high-desert Northwest, Wingworks feature a weight bearing waist belt, 100 oz. plus water capacity and restriction-free movement for walking and shooting.They accomodate the layered clothing approach to the variety of weather encountered in fall hunting conditions. Durable Mesh, Cordura and Ballistic Cloth construction, simple adjustments, exceptional load capacity and small body footprint set WingWorks apart from the rest. Built to hold up to hard use day after day, in a variety of climates and terrain. 4/11/19 Shipping and taking online orders as usual, but still working on the building most days, not taking working hour calls. Email response will be better than phone message call-backs. 2/19/19 Extending down time until 3/12/19, all website orders will be disabled until we return. We will have more XL Blaze gamebags on our return. 1/19/19 As predicted we’ve run out of XL Blaze Gamebag components, more are on order. Consider a Non-Blaze vest, they’re more versatile for other species like duck, doves and turkey. 7/13/18 We’re getting into the busy season, so if you need help with order issues or questions, consider emailing us before calling. We don’t pick up calls very often during working hours, and usually reply within the day. Online ordering is also helpful and saves everyone time, helps understand the product and options. 8/6/17 Grouse Pockets have arrived, we’re looking at non-blaze and blaze pocket flap styles. Keep in mind that these are basic pockets designed to seal out debris and fit close to the body without appendages and add-ons in the woods. No Molle or trick pouches on this style. We still recommend the long pockets for most Western hunting. 3/23/17 We’re still getting a lot of orders with pants waist size instead of “waist at navel” measurement. If you can’t handle the truth, have a friend do it for you! WHAT’S CHANGED ON THE NEW VESTS? Molle pouch bases on each long pocket flaps allowing larger iPhone and pistol holster options, New roomier pouches on each long shellpocket for Garmin Astros, Alphas and others, bear spray, etc. Some experimental larger gamebags and breathable mesh long pockets for trainers and outfitters. Call or email us. 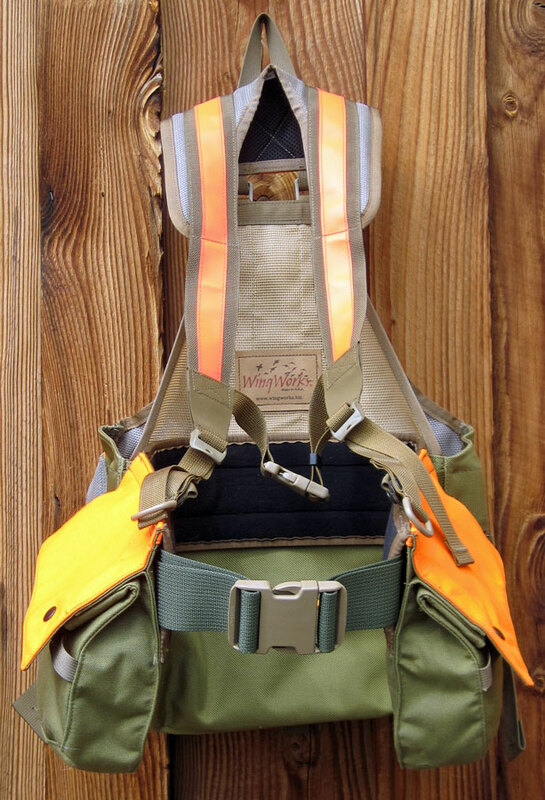 WHAT SEPARATES WINGWORKS FROM OTHER UPLAND VESTS? Bombproof 1050d Ballistic Cloth exterior, fully lined with 420 denier nylon packcloth, beefed up sewing where it counts. Modular Design: Components will continue to be interchangeable to allow users to keep up with design improvements. Hunter ergonomics dominate design priorities, to minimize interference with climbing, walking and shooting. Versatility in a variety of hunting and weather conditions; small on-the-body footprint for warm weather hunting, simple adjustments. 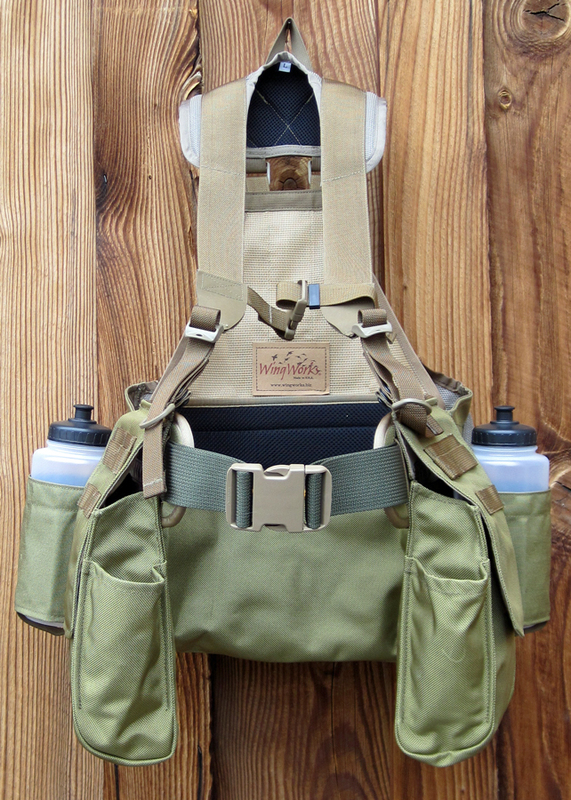 Game Bag: Aqualon bloodproof barrier against hunter, 2 zippered accessory pockets on each side, extra water/convenience pouch inside, bringing designated water storage to 118 oz (using Ultimate Direction 54 oz bottle or hydration reservoir). Roomy rear accessory zippered pouch. Rear tie-down for extra jacket or shed antlers. Shell Pockets: On your sides where they don’t interfere. This also works for horseback hunters and ORV riders who need side-mounted bags. Pocket flaps Velcro inside pockets for fast shell access. 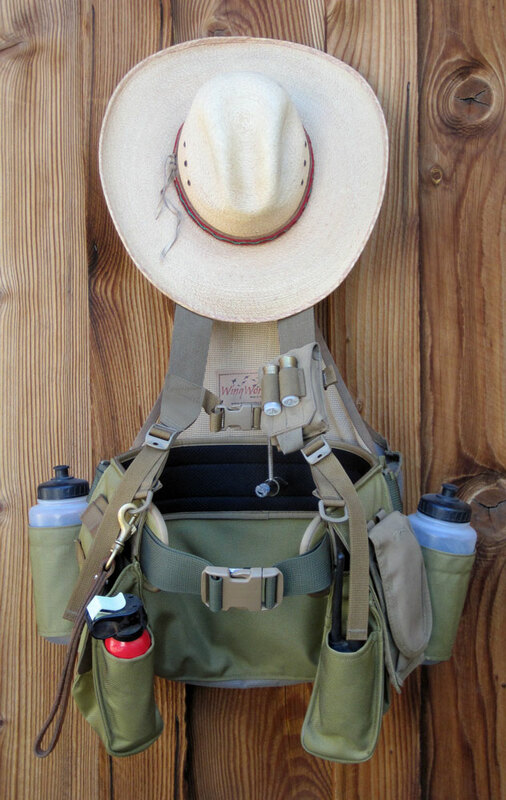 Each pocket will accommodate large spring water bottles and training birds for trainers in hot climates. Strap connection through water holsters and game bag minimize flopping and hold vest together as a unit. Deep enough that you won’t lose shells, and can carry enough. Water Holsters: Removable, easy access holsters hold squeezable BPA free 32 oz squeeze bottles for dogs and hunters. 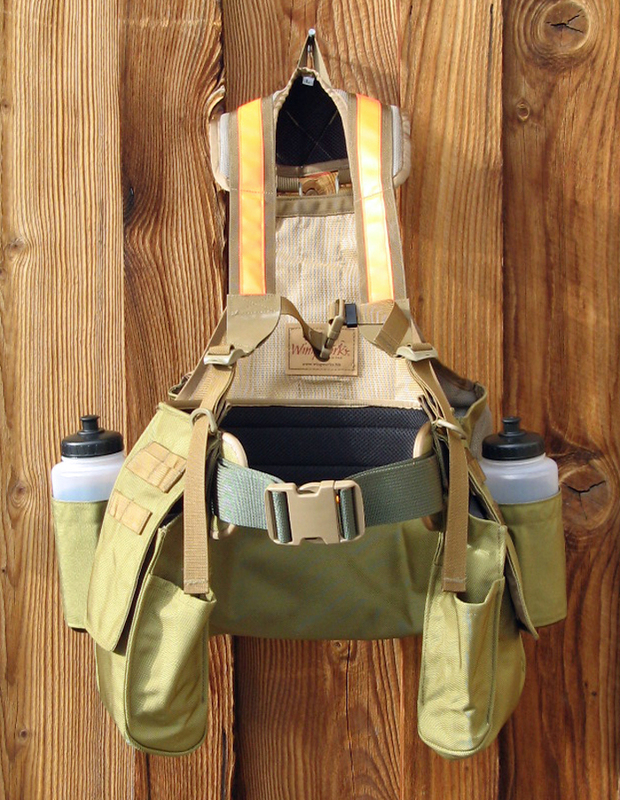 Shoulder Harness: Sternum Strap Harness for its’ quick adjust and suitability to more difficult terrain and heavy loads. It adjusts in front and back to place the yoke where it needs to be regardless of size. 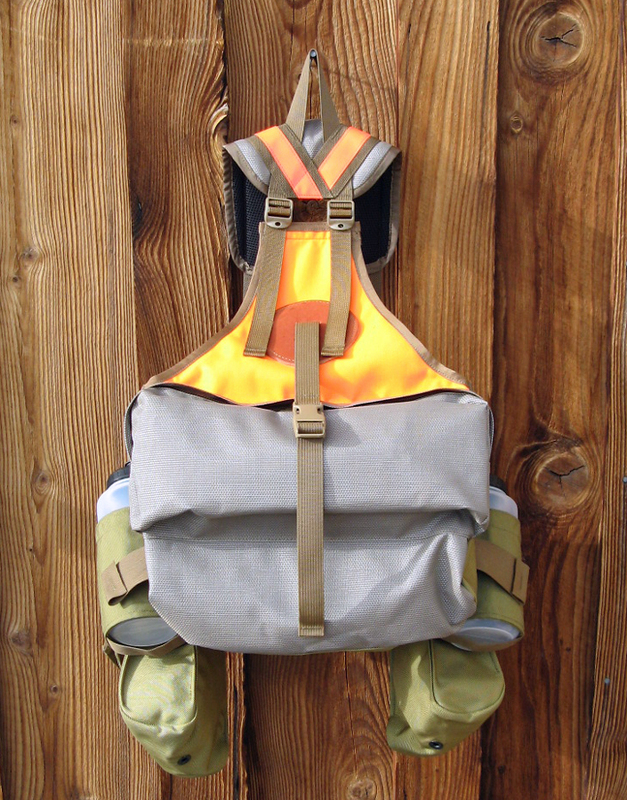 Lightweight nylon shoulder straps won’t interfere with gun mount! Hip Suspension Belt: Comfortable, weight-bearing waist belt keeps load on leg and thigh muscles and stress off shoulders for more freedom of movement and less fatigue. Belt adjusts easily with 2” cam or side release buckle, and offers comfortable lower back support. Blaze Detail Vest runs about 140 square inches of Blaze Orange, about 180 inches with the Blaze Orange Harness. Will need to be supplemented to meet some state requirements.